Google: the search engine to end all search engines. Naturally, advertising with Google AdWords is a necessity for any efficient digital marketing campaign. By targeting customers through keywords and pinpointing those that are searching for what you have to offer, you can find your most promising leads at the very moment that they’re searching for a service or product like yours. A Google AdWords dashboard helps you stay on top of your game in finding just the right keywords for just the right audience. Create your Google Adwords dashboard today! See this dashboard in action here! Whether your own or your client’s logo, make your report reflect your brand! Drag-and-drop your widgets onto your dashboard to create a clean report layout that includes all the information you need. Customize your widgets to show the data you want, the way you want to. Featuring the most common KPIs, these widgets are ready to use! Drag, drop, done! 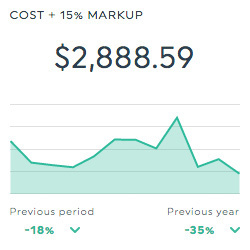 This historic widget shows the amount you spent on clicks and impressions for your ad, plus an additional 15% markup (so that your clients can see their true expenditure). 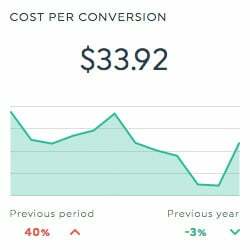 This historic widget shows the average amount you spent on each conversion. It is calculated by dividing the total spent by the number of conversions. 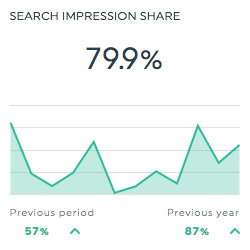 This historic widget shows the percentage of impressions that your ads receive when compared to the total number of impressions that your ads could potentially have received. It is calculated by dividing the number of impressions by the total number of eligible impressions. This list widget shows you your AdWords campaigns, in order of number of clicks each received. Want to see all our Google AdWords preset widgets? You’ll find them in your new dashboard! This is the number of clicks on your ad. This is the position in which your ad typically ranks against other ads. This is the total number of conversions for which a specific keyword contributed one or more assist clicks. An assist click is any click a particular keyword received prior to a conversion (therefore, it excludes the last click). This is the average value attributed to all your conversions. It is calculated by dividing the total conversion value for all conversions by the number of total conversions. This is the total you spent for 1,000 impressions of your ad. Effective Revenue Share (ERS) for Conv. This percentage indicates the profitability of your ad campaign. It is calculated by dividing your ad cost by your total conversion value, and then multiplying the result by 100. Return on Ad Spend (ROAS in $) for Conv. This is the return on your total ad spend. It is calculated by dividing the conversion value by the total ad cost. Return on Investment (ROI) for Conv. This is the total return on investment of your ads. It is calculated by subtracting the ad cost from the revenue, and then dividing the result by the ad cost. This dimension allows you to isolate your data based on the device the user used to see your ad. This dimension allows you to isolate your data based on the keyword used in your ads. Want to see all our Google AdWords metrics, segments, & dimensions? How do I create custom dashboards using the AdWords reporting API? How do I add my agency markup to AdWords/Bing costs? Am I missing any latent conversions in AdWords? How do I create a Master AdWords dashboard with all my clients’ accounts? What is the best third-party reporting tool for AdWords? You are 4 minutes away from getting a higher ROI on your AdWords campaigns!